To make the dressing, just add the lemon zest and juice to the pesto, mix well and set aside. Toast the pine nuts on a dry pan set over a medium heat for 3 to 4 minutes, until golden. Immediately remove from the pan onto a cold plate to stop the cooking process. Trim the asparagus, brush with a little oil and cook on a hot griddle pan until tender. Repeat with the peach wedges and cook until nicely marked, turning carefully to keep the fruit intact. Finally, cook the halloumi until golden and marked on both sides. Toss the rocket with a little of the lemon pesto dressing and place on a serving plate. 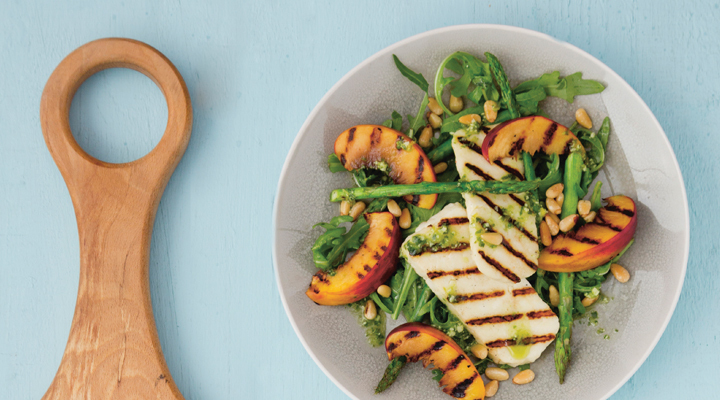 Arrange the asparagus spears on top, followed by the peaches and halloumi. Scatter over the toasted pine nuts and drizzle over the lemon pesto. Any remaining pesto will be delicious on freshly cooked pasta.